Heat oven to 375°F. Crumble sausage into 12-inch nonstick skillet. Add bell pepper and onions; cook over medium-high heat until sausage is browned, stirring occasionally. Drain. Stir in all remaining ingredients except cheese. Spoon into ungreased 13 x 9-inch (3-quart) baking dish. Cover tightly with foil. Bake at 375°F. for 1 to 1 1/4 hours or until rice is tender. Remove from oven; sprinkle with cheese. Return to oven; bake an additional 5 minutes or until cheese is melted. Chorizo is a highly-spiced pork sausage used in Mexican and Spanish cooking. Garlic and chili powder flavor the coarsely-ground pork. Kidney beans can be used in place of the black beans. Southwestern-style stewed tomatoes can be substituted for the Mexican stewed tomatoes. To keep the casserole warm at the table, place the dish in an insulated casserole holder. 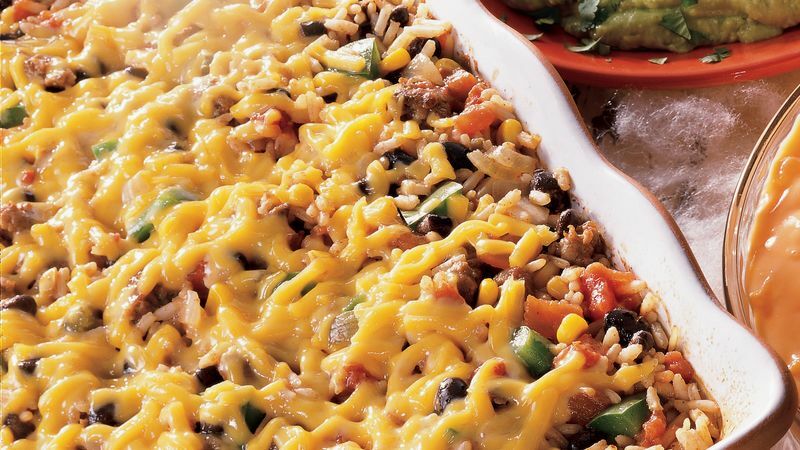 Serve the spicy casserole with warm tortillas and sour cream.